Engineering scholarships at UNC Asheville are merit-based and are intended to recognize significant academic achievement by students actively following one of NC State's engineering curricula. These include the Joint Bachelor of Science in Engineering with a Concentration in Mechatronics and those of the 2+2 Engineering Program. 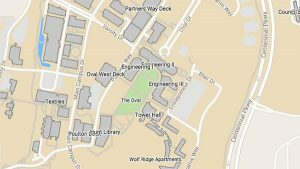 To be eligible for an engineering scholarship, students must plan to be enrolled full time at UNC Asheville (at least 12 credits per semester) and must follow an approved NC State Engineering curriculum. One general application (PDF) allows students to be considered for all appropriate engineering scholarships. Continuing UNC Asheville students may apply for scholarships and must earn a 3.0 GPA in the current semester and maintain a 3.0 cumulative GPA to be eligible. Fill out the application form and submit it to the address below by April 15 to be considered for an award in the upcoming year. The recipient must compose a letter of appreciation to the scholarship donor. The Financial Aid Office will provide address information and letter-writing assistance if necessary. The recipient must attend the UNC Asheville Scholars Luncheon in October. The recipient must maintain a GPA of 3.0 or better each semester to retain the scholarship. Scholarship awards are typically divided equally between the two semesters. If a recipient earns less than a 3.0 in the fall semester, the award for the spring may be withdrawn. For questions and inquiries, contact the UNC Asheville Engineering Office at 828.251.6640, engineering@unca.edu.